Attach this frameless door to your shower for a classy, simple look. Classic chrome finish looks great in a variety of bathrooms. Since it is made by Aston, you know it is sturdy, yet stylish. 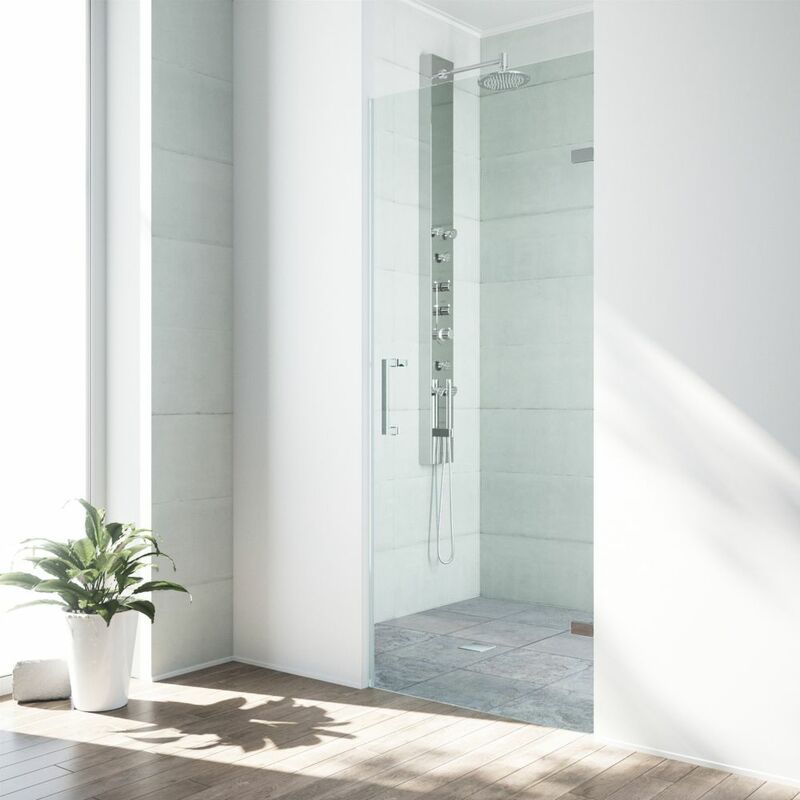 MAAX Insight series shower door has clean modern lines and will make any narrow shower seem larger and brighter. The clear heavy duty glass with its chrome tapered knob adds that high end look while the reversible door is perfect to match the layout of your bathroom. Door fits standard size openings. Perfect for that do-it-yourself bathroom renovation. Chrome Clear Soho Frameless Shower Door 26 Inch 5/16 Inch glass Experience fine quality combined with superior design with a VIGO SoHo frameless shower door. The square hinges swing outward and the square handle adds defined shape for a sharper feeling bathroom. Single water deflector redirects water toward the inside of the shower. Side and door clear seals keep the shower water resistant between wall and glass door or fixed panel. Chrome Clear Soho Frameless Shower Door 26 Inch 5/16 Inch glass is rated 4.4 out of 5 by 34. Rated 3 out of 5 by Javiter from Great door poor seal! While the door is very sturdy yet elegant, the bottom seal wears out quickly and allows water to leak onto the floor outside. I just replaced it and made no difference. Rated 2 out of 5 by Handyman from Screws bender After 4 days after the installation doors tilted and we realized that the screws bended. I have photos to show. Rated 4 out of 5 by Mistad from Decent shower door Very nice looking door at a fair price. Instructions are lacking in clarity as how to install the lower seal. Leaks a little more water than I would like. Rated 5 out of 5 by Moises from Looks modern! I ordered this door in November 2018 and received after three weeks. I like everything about this door except that I had to buy longer screws from a hardware stored. It is a heavy door and wish the hinges were made up stronger. Rated 5 out of 5 by SharonK from Very elegant look We bought this for our new house. Our contractor did the installation and he had to modify the fit just a bit, it was not quite wide enough for 24" doorway. We love the look and the thickness of the glass makes it appear very sturdy. Rated 5 out of 5 by PHEVDave from Perfect! Exactly as I hoped! Very straight forward install. Nice looking unit and fits perfectly in the shower and bath environment. I made sure ot add a 2x4 behind the wall where I screwed it in - it literally hangs on two hinges, with two screws each, so they all better be solid. Has some adjustability too which helps if walls are slightly off level. I would definitely recommend and buy again.